Have you ever noticed how cheap chicken drumsticks are? I picked up a dozen yesterday from the grocery store for five bucks. Forty cents a piece is much easier on the meat budget than a $60 brisket. And while I would love to smoke a juicy brisket each and every time I get out my Traeger, it’s just not economical. Am I right? So how do you take a super cheap cut of meat and make it look and taste like something out of a food magazine? This is a bit of a labor intensive recipe but the reward is scrumptious and delightful. The secret is prep and precision and the steps and recipe below will help you achieve drumstick divinity. 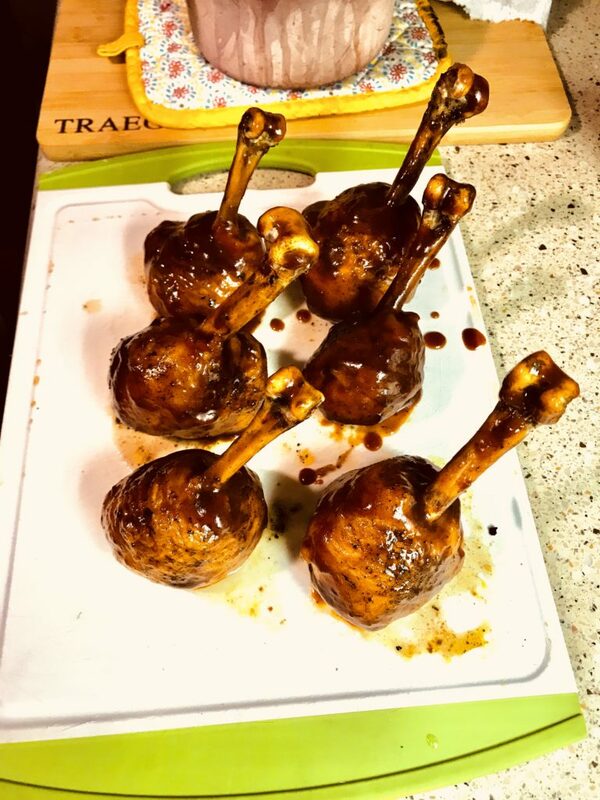 Rinse and pat dry each drumstick with paper towels. Trim any excess skin from the bottom of each piece and make sure any skin left stays in contact with the meat of the drumstick. 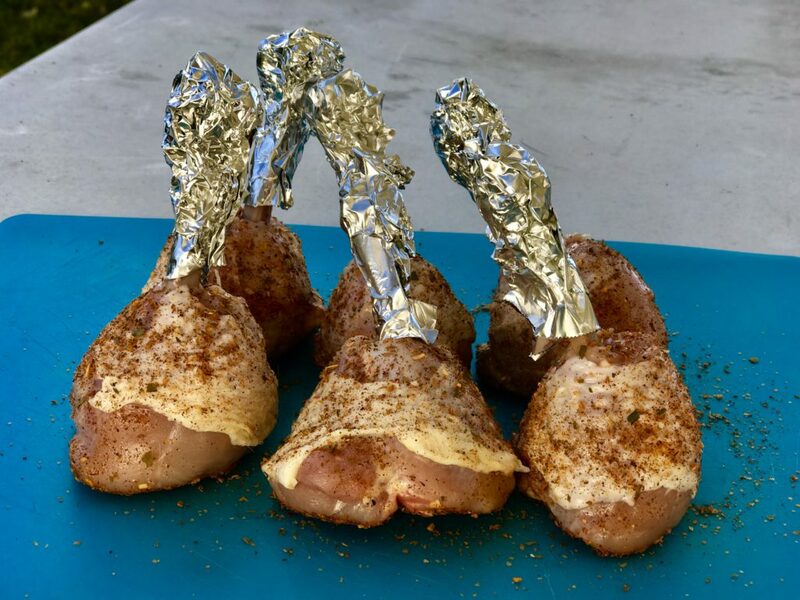 Take each drumstick and with a sharp knife or pair of sharp kitchen shears, cut just below the knuckle of the drumstick all the way around the bone and push all the meat towards the bottom where most the meat is. Pull the skin back up and just above the meat, cut and remove the skin that was around the bone and remove any tendons that are exposed. Trim and remove the small bone that runs against the leg so that the bone is clean. Wrap a piece of aluminum foil around any exposed bone to keep it from scorching during the cooking process. I prefer my lollipops to be sweet so I use a rub that has some sort of sweetness in it. 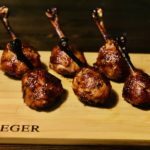 I use the Traeger: Pork and Poultry Rub which has apple and honey in it to give it a good sweet yet savory flavor of your meat. Dust your lollipops liberally with your seasoning and let sit in the fridge for 30 minutes to an hour so that the meat can absorb the flavor of the rub. While it’s resting in the fridge, turn your smoker on and set it to a smoking temperature. Wood pellets grills will smoke meat at a temperature range from 160 degrees Fahrenheit to 225 degrees Fahrenheit. Any hotter than that and you’re using the wood pellets for heat only rather than smoke and heat. 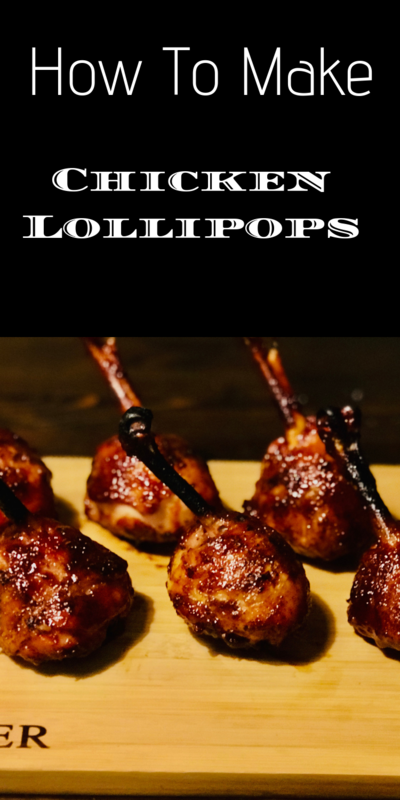 Now that your lollipops are seasoned and your smoker is smoking, place each lollipop upright directly on the smoker and smoke them for 30 minutes. I prefer to smoke these at a temperature of 225 degrees Fahrenheit. After 30 minutes, remove your lollipops and turn up your heat to 350 degrees Fahrenheit. While the smoker is coming up to heat, place a pan with one stick of butter in the smoker to melt the butter. This butter will keep your lollipops moist during the cooking process. Once your smoker has reached 350 degrees, place your lollipops into the pan upright as you did previously while smoking them. Cook lollipops until an internal instant read thermometer reads 165 degrees F. This should take about 35-45 minutes. During this cook, warm up your barbecue sauce in which your lollipops with take a bath. You can warm it up either on the stove or in your smoker as long as you watch it carefully. Again, I prefer a sweet sauce but the choice is yours. You want your sauce to be thin enough to dip the lollipops in but thick enough to stick to the meat. You can add butter to your sauce if you need to thin it out a bit. 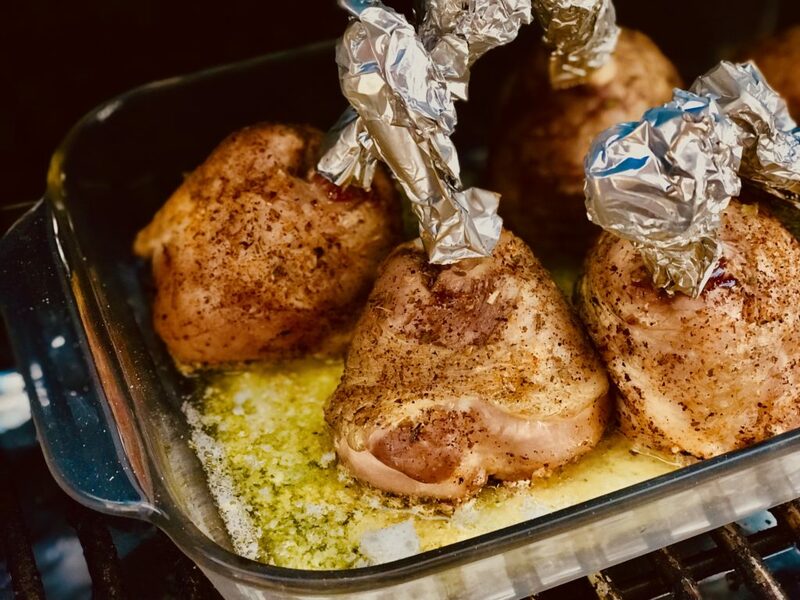 Once your chicken has reached an internal temperature of 165 degrees F, remove them from the smoker and increase your smoker temperature to 450 degrees. While your heat is increasing, remove the foil from each lollipop and completely submerge each one in the barbecue sauce. This is the messy part as you can see by the picture. You can use a silicone brush for this step if you like but dipping them in the sauce creates uniformity. 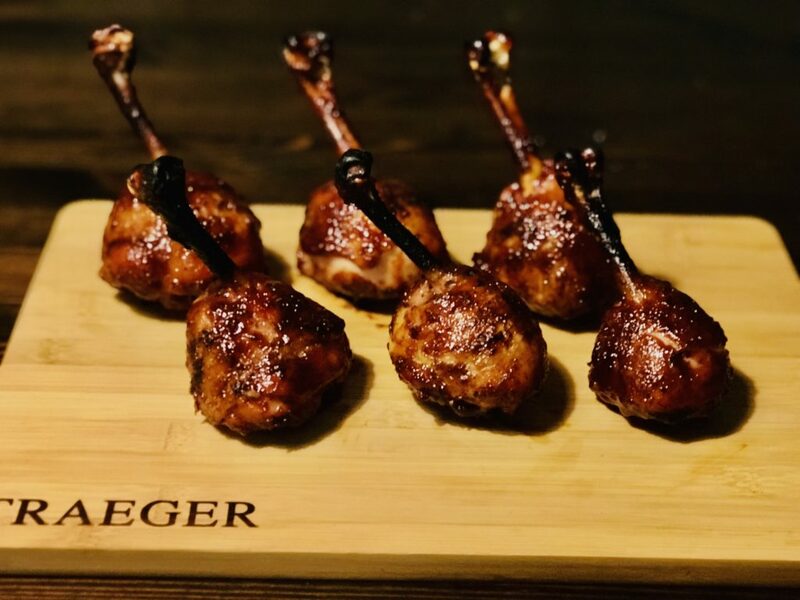 Once your lollipops are dipped and your smoker reaches 450 degrees F, place your lollipops directly on the grill upright as before and cook until they reach an internal temperature of 175 degrees F. This step tightens your sauce and crisps the skin around the drumstick. Remove and let rest for 5-10 minutes and enjoy. 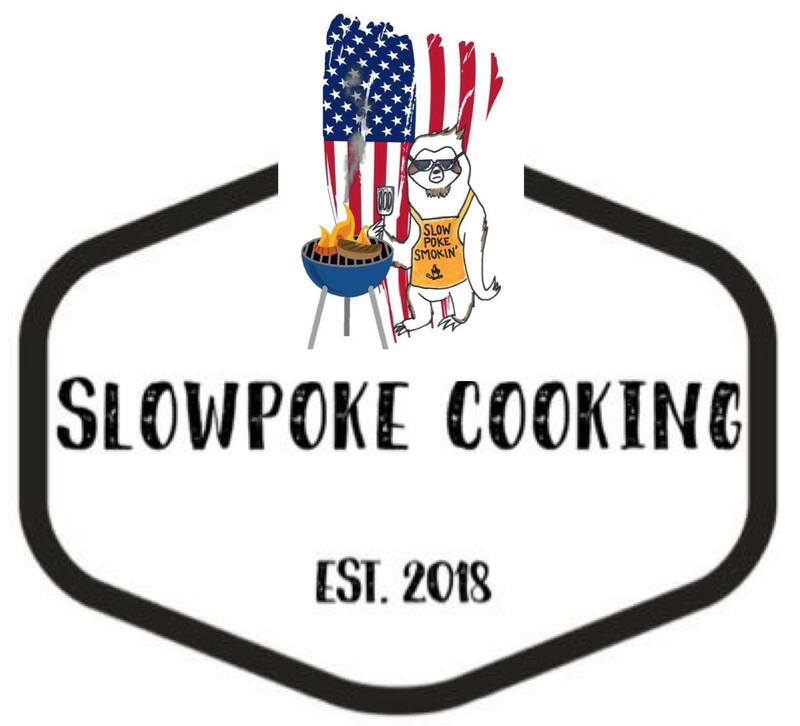 Smoke 30 minutes at 225 degrees F.
Cook 35-45 minutes at 350 degrees F or until internal temperature reads 165 degrees F.
Cook 10 minutes at 450 degrees F or until internal temperature reads 175 degrees F.
Let rest 5-10 minutes and enjoy.